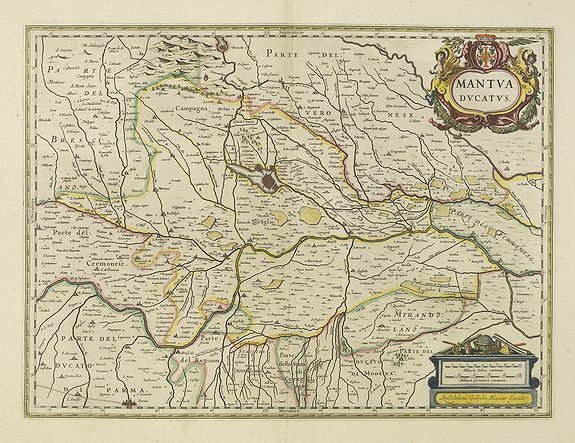 BLAEU, W. - Mantua ducatus. Mantua ducatus. - BLAEU, W.
Map maker : BLAEU, W.. Size : 13.8 x 18.5 inches. / 35.0 x 47.0 cm. Description :Centered on the town of Mantua. As Willem Blaeu died in 1638 most of his maps are actually published by his son Joan. This maps carries his (engraved) signature and was actually published in volume II of a French edition of his "Le Theatre du Monde ou Nouvel Atlas", dated 1638, therefore published the last year of his life. From early on Willem Jansz. Blaeu aimed of publishing an atlas to compete with the Hondius-Jansson Atlas. By 1630, he had published at least 17 folio size maps. Blaeu was able to realize his plan soon after he had acquired the copper plates of the atlas maps by Jodocus Hondius. The "Appendix followed in 1630. In 1635 he finally realized a "international edition" of a world atlas, the "Theatrum Orbis Terrarum". This example is from a very rare 1638 French text edition, which has the same copperplates as the 1635 edition, however the text on the verso was reset in two text columns. This edition is the last version the great master printed under his patronage. Condition : Dark impression, printed on heavy paper. Mint condition. Printed on heavy paper. Very good and dark impression. French text on verso.